The D96-TCE Albatross, formally designated as the D96 Troop Carrier, Equipment Dropship, is a heavy-lift dropship in service with the United Nations Space Command. 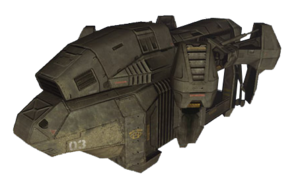 Manufactured by Ushuaia Armory, the Albatross is one of the UNSC's primary modes of long-range matériel deployment, transporting troops, vehicles, and equipment across long distances. While the Albatross is an indispensable part of the UNSC's fleet of dropships, it remains behind the Pelican in terms of importance. The Albatross is similar in operation to the D82-EST Darter, which specializes in the transportation of base supplies. The functionality of the D81-LRT Condor overlaps with both the Albatross and Darter, though the Condor is equipped with a slipspace drive. A heavy-lift dropship manufactured by Ushuaia Armory, the D96-TCE Albatross is capable of deploying equipment behind enemy lines from both atmospheric and exoatmospheric locations. Although Albatrosses posses no offensive capabilities as they are not typically armed, its nimble maneuverability and heavily protected, expansive cargo bay allow it to transport troops, vehicles, and equipment safely. Lacking a slipspace drive, the dropship's propulsion system consists of four engines, two on each side, attached to the Albatross' body. The dropships are also equipped with an autopilot feature that allow them to be operated remotely by a dumb AI. The cockpit, located at the front of the Albatross, allows for a single pilot and one or two crewmen. The Albatross' large cargo bay can carry between forty-five to fifty passengers, or vehicles and weapons for battlefield deployment. Once the dropship has landed, the Albatross lowers three metal ramps holding the bay, allowing its cargo to be unloaded. Heavily armored, the Albatross is able to serve as a makeshift base or command center. The Albatross has been a part of the United Nations Space Command's fleet of dropships for many decades. In 2517, during a training mission for the young Spartan-II candidates, an Albatross deployed the seventy-five children to the Military Wilderness Training Preserve in Reach's Highland Mountains. An Albatross was later commandeered by the children to return back to the Reach Naval Officers Academy, autopiloted by the dumb AI Déjà. The Albatross was also used throughout the Human-Covenant War. During the Battle of Installation 05 in 2552, UNSC In Amber Clad deployed the surveillance team RECON 127 to Installation 05 to investigate a Forerunner structure on an island, but the team met heavy Covenant opposition and their Albatross was shot down over the island. UNSC Aegis Fate deployed the Albatross 03 to an abandoned Jiralhanae base, where the ultimately dropship crash-landed nearby. Following the Covenant War, the Venezian Militia had acquired an assortment of Albatrosses, among other UNSC aircraft, hidden in a hanger under Mount Longdon Road in New Tyne. After the Rookie's death in the rebellion on Draco III in 2554, an old Albatross was used by Alpha-Nine to bring his body out to one of Draco III's oceans. 03: Attached to UNSC Aegis Fate, 03 crash-landed near an abandoned Jiralhanae base. An albatross is a seabird, in keeping with the UNSC's tradition of naming most of their atmospheric vehicles after animals. Some Albatrosses have words inscribed on their hulls by their crews, similar to those pilots painted on the exterior of their bombers in World War II. 03 bears the words "Covenant Killer Mk C" and "Humanity-1 Flood-0". A crashed Albatross on the Halo 2 map Relic. Front view of the Albatross on Relic. Rear view of the Albatross on Relic. Various views of the Albatross. An Albatross cargo bay on the Halo 3 map Sandtrap. An Albatross on the Halo 2: Anniversary map Remnant. An Albatross in Halo: The Fall of Reach - The Animated Series. The sillhouette of an Albatross.